What does this list of American authors tell us about the president? Well, it's not as fun as the year Bush decided to read Camus' The Stranger. 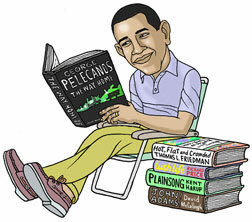 George Bush reading a French Existentialist is like Obama reading a Cabela's catalog. Plus, it was a story about a one-time layabout turned unrepentant Arab killer, which, if you wanted to overinterpret things, gave you enough material to get you through a few packs of Gauloises. The Obama selection is not overtly controversial. In 2006, Bush's list included The Great Influenza, about the 1918 flu. If Obama were reading that today while his White House was issuing a new report about the H1N1 virus, he'd start a national panic. But his list is also clearly not poll-tested. Women played a key role in Obama's victory in 2008. They're swing voters. And yet all of Obama's authors are white men. The subject of the longest book, John Adams, is a dead white male. Obama couldn't get away with that in an election year, and, given his aides' penchant for cleaning up little things like this, we'll soon see the president with a copy of Kate Walbert's A Short History of Women.